He has a monkey on a chain. And an owl – also chained. Teven Say, a master of magical tattoos, strokes both of his familiars and regards me with a proud gaze. He is sitting in a large shed in Siem Reap, Cambodia. Stripped to the waist, his muscular torso is webbed with ink. Tangled outlines of gods and sacred geometry weave around his fists and arms like wires in a fuse box, pulsing with an ancient magic. One of his students connects a tattoo gun to a battery pack. Teven Say dips the needle in black ink and tells me to lay down. I start sweating. 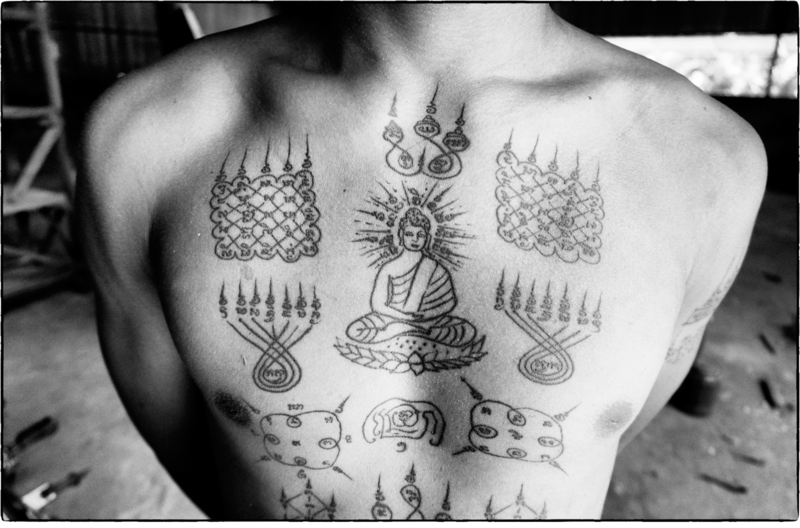 Magical tattoos, known as sak yant in Khmer – the language of Cambodia – are believed to render their wearers impervious to bullets, protect them from misfortune and endow them with sexual magnetism. While the tradition prevails throughout Southeast Asia, little is known about the art in Cambodia, partly because of a 1920 royal ordinance that forbade monks from tattooing and partly because the remaining practitioners were killed during the Khmer Rouge genocide and civil war. Today, traditional Cambodian sak yant is especially difficult to find because those who are still practising the art form are reluctant to publicise their activities. Teven Say is among the handful of tattoo masters left. He and others I meet describe arduous treks through the war-scorched kingdom searching out the last remaining holders of this torn tradition. They collect tattoo designs into personal grimoires and learn the occult techniques needed to transfer power into the designs. Magical artwork adorns the chest of one of Teven Say’s students. Chan Tra, a sacred tattooist in Phnom Penh, follows eight holy precepts (three more than those ascribed to Buddhist laypeople) in order to keep himself a pure conduit for magical power. Inside his single-room shop, the walls are covered with designs: Brahmanic deities with swarming arms, geometric shapes (known as yantras) and swirling spells. WHEN TEVEN SAY PUTS his needle to my back I feel a burning sensation. He could have used the traditional bamboo needle but apparently the power remains the same regardless of the instrument. So I chose the gun because it is quicker and more accurate. He begins searing the sign for the divine mother, with its Swiss-roll swirl and three peaks, onto my left shoulder blade (the left side is the feminine side, associated with compassion). Audible above the tattoo gun’s buzz is the oddly comforting mantra he is muttering. In the endless forgotten past, before Southeast Asia was so called, people of my age were feeling the same burn and hearing similar comforting chants. The chants heard by initiates of the aboriginal tribes that populated south China and Southeast Asia from the first millennium BC were different but also served a sacred purpose. In animistic cultures, all things are imbued with spirit and therefore sacred. Their tattoos are mentioned by Sima Qian, China’s grand historian of the Han dynasty, who wrote, in the first century BC, that they “cut their hair and tattooed their bodies”. Shamans dreamed designs and watched them bloom from the tips of bamboo needles – giving tribal members ” sak” was their sacred duty. The word ” sak“, meaning to “prick” or “jab”, survives to this day. Indeed, Bangkok-based writer Joe Cummings, whose book, Sacred Tattoos of Thailand, was released in 2011, explains that the word occurs in several languages spoken by the indigenous tribes of Southeast Asia, suggesting it comes from an older root language. It’s clear that sacred tattoos existed long before the first Indian trading ships arrived in Southeast Asia, in around 200BC, beginning a period called “Indianisation”, when Buddhism, Brahmanism and animism bubbled in the seething mindscapes of the region for thousands of years. Eventually sak yant emerged. Experts disagree about how this happened. Zhou Daguan, a Chinese diplomat who visited the ogival towers of Angkor in 1296, noted that the king was protected from arrow and sword wounds by takruts – tiny cylinders made from leaves of rolled metal inscribed with prayers and inserted beneath his skin (a similar practice persists in rural Cambodia: a shaman I met last year wrote mantras on thin metal leaves, rolled them up and threaded them on string, to make a protective charm). According to the late scholar of Cambodian Buddhism Ian Harris, there is a design that bears similarities to today’s sak yant engraved on one of the foundation stones of Angkor’s Bat Chum temple. It features 48 syllables arranged on a lotus blossom. But there’s no evidence that the Brahmanic Angkor civilisation – which flourished between the ninth and 15th centuries – was the place where indigenous tattoo practice married with the Indian sacred imagination to create sak yant, even if similar practices did exist. Although temples in Thailand depict tattooed people, nothing similar has been found in Cambodia. “If Angkor subjects were inking up, there ought to be a written record somewhere,” says Cummings. Some researchers maintain that the early, Indian-influenced civilisations of Southeast Asia are the most likely origin of sak yant. “It is likely that [tattooing] is an indigenous form that developed with Indian interaction,” says Jonathan H.X. Lee, associate professor of Asian American studies at San Francisco State University, in the United States. Could it be that the holy chants of the tattoo master once echoed in the stone corridors of Angkor? 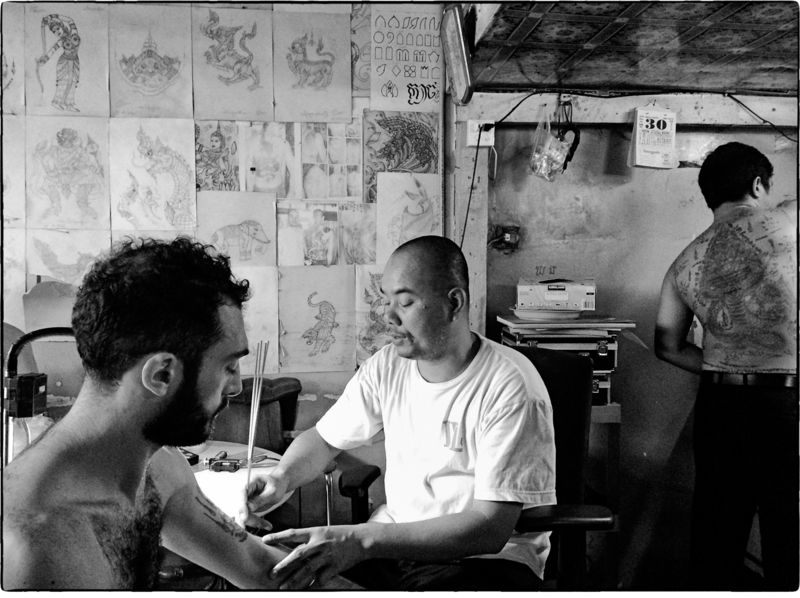 Tattooist Chan Tra blesses a sak yant on the arm of writer Nathan Thompson, in Phnom Penh. In another time and place, a holy tattooist chanted softly as he focused on the ink and blood-blatted back of Angelina Jolie. It was 2004 and the American actress was celebrating being offered Cambodian citizenship by getting a sak yant of a Bengal tiger. Jolie has two holy tattoos (the other is a Buddhist prayer rendered in Khmer script on her left shoulder). Through her patronage, the spirits of sak yant have emerged into the global consciousness. Now they are coveted by fashionistas, but Thai traditionalists raised concerns earlier this year about Westerners getting sak yant with little regard for their spiritual significance. In Cambodia, too, getting inked involves a serious spiritual commitment. Traditionally, it included a period of mentoring with the tattoo master, during which the initiate was trained how to live a good life. If the rules are respected, the tattoo remains powerful. Sak yant initiates are expected to abide by the five Buddhist precepts for laypeople: no killing, stealing, lying, intoxicating the mind and using sexual energy to harm. Other rules are added depending on the master and can include dietary prohibitions and a ban on kissing your wife below the waist (based on the Asian belief that the lower half of the body is unclean). TEVEN SAY LAID OUT the rules before he began. I needed to abide by the five precepts and also not eat dog or snake meat (mercifully, the rule about below-waist kissing was omitted). The tattoo gun’s buzz starts again, the sound coming from my right shoulder. Teven Say scorches down the symbol for the divine father (the right side is associated with masculinity and wisdom). He and his students are not concerned about giving sak yant to foreigners. One person who believed in the power of sak yant was Lon Nol, the Cambodian politician and general who led a coup against Prince Norodom Sihanouk in 1970. Towards the end of his five-year reign, his behaviour became increasingly Macbethian. 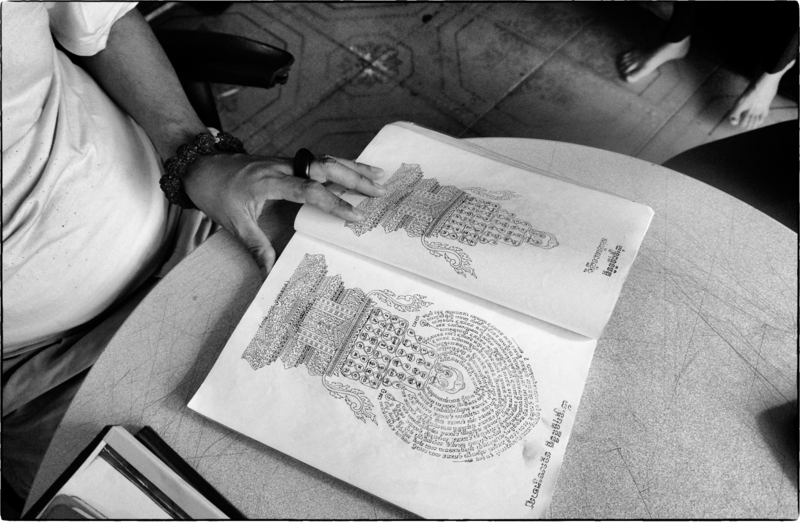 As the soldiers of the Khmer Rouge bore down on his Phnom Penh stronghold, the capital’s pagodas became factories where monks produced magical undershirts – spiritual body armour covered in magic symbols – to protect his army. Lon Nol also encouraged soldiers to get tattoos so the power of the Buddha could enter their flesh. By 1975, when Khmer Rouge bullets began to hit the capital, according to Harris, he was spending US$20,000 a month on astrological consultations. Deposed by the victorious communists, Lon Nol fled into exile. The turmoil that followed meant the demand for protective tattoos remained, despite efforts by the Khmer Rouge to stamp out the practice. General Nhek Bun Chhay, who commanded the royalist forces during the civil war of the 1980s, still believes in the power of holy ink. Inside his office, Nhek Bun Chhay – a stocky, wide-faced man – sits with a handful of staff. Now 57, his tattoos are faded like the photos on his wood-panelled walls. In the early 80s, when he was a young soldier, he spent a year serving as a real-life sorcerer’s apprentice. At the end of his training, his master blessed him with several tattoos. Along his jawline, mantras in Pali – the liturgical language of Theravada Buddhism – were inked to give his voice the power of command; a sak yant on his arm was intended to give him the strength of seven elephants; and a net design on his chest and back protects him against all kinds of danger. His mentor, like most if not all of Cambodia’s wizards, has since died. Nhek Bun Chhay laments the dying out of a power that he believes saved his life. 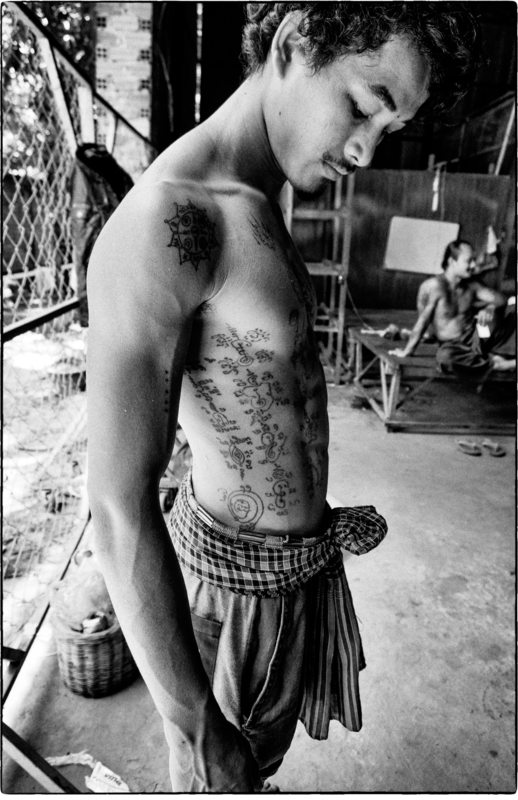 Over the border in Thailand, the tradition of sacred tattoos (also called sak yant) is as tough as the jungle vines. Lineages that stretch back hundreds of years continue to hold people’s imaginations. But, in Cambodia, the lineages have been badly damaged. “I couldn’t find a single tattoo master with a real lineage [in Cambodia],” says Cummings. Now it is up to artists such as Teven Say and Chan Tra to nourish what is left in the hope sak yant can again grow into something relevant. IN PHNOM PENH, Chan Tra is finishing a Phutson sak yant (” Phut” stands for Buddha and ” son” means layering) design on my arm – my third after the two I received from Teven Say in Siem Reap. Afterwards, Chan Tra takes three fragrant incense sticks and circles the fresh tattoo, praying feverishly in Pali. A rattling fan swings from side to side, causing the designs stuck on the wall to flap slightly. He makes me promise to return on the next full moon, to make an offering to the spirits of sak yant. Chan Tra finishes the blessing by blowing on the design, activating it. The term “misunderstood” itself is a subjective one. I mean, what might not be understandable to some, for others, might seem plain as day. In many cases, the man who gets labeled as “misunderstood” is the one who’s most in tune with himself. Today, realness can stick out like a sore thumb, especially when the rest of the world appears to be caught in between smoke, mirrors and photo filters. It feels like everyone is constantly trying to be someone or appear some way, striving to uphold an impression of normal – one perpetuated by trends and hashtags – and those who fail to play along are seen as outcasts. Just because you fail to adhere to society’s method of doing things, however, doesn’t necessarily mean you’re incapable of being understood. Sure, people might not personally relate to all the specific things you find interesting – or choose to engage in – but who said they’re supposed to? When people are dubbed “misunderstood,” most of the time, this translates to them deviating from the norm. You know, they’ll be the ones listening to indie music, watching independent films – generally being, you know, independent people. When people choose to be independent and follow their own instincts, it shows a confidence in themselves. It shows a security within themselves. When people choose to express themselves truly – and this deviates from society’s construct for how they should be expressing themselves – the easy thing to do is view them as deviants and plead ignorance – call them misunderstood. But, like I said, “misunderstood” is subjective to who is doing the understanding, so to speak. Just because one chooses not to sway with whatever the masses are preoccupied with doesn’t mean he or she is at all conflicted. In fact, here’s why being “misunderstood” can be the best thing that’s ever happened to you. You appeal to a wider variety of people. You never truly fit into one, clear-cut group of people. You weren’t athletic enough to be a jock, and you never enjoyed drinking beer enough to pledge a fraternity. You have always sort of drifted in and out of different groups of people, depending on what inspired you on a given morning. This allowed you to meet a large network of people. You never really wanted to settle in with just one group of friends; you always viewed that as limiting. At the same time, you were never lonely, given your ability to interact and share interests with a broader variety of individuals. Sure, it might be difficult for you to identify with one specific “clique” in particular; you realize different aspects of your being will appeal to different groups of people – and that’s always been fine with you. People won’t be as likely to take advantage of you. Throughout your life, people have always mentioned you’re “hard to read.” While you’re not entirely sure what this even means, you’re not necessarily complaining either because it’s prevented others from taking advantage of you. You never wanted to be easy to read, especially in business situations. When people can gauge your behavior – and presuppose how you’d react to certain outcomes – they can gain leverage on you. For this reason, you really don’t care to explain yourself all that much to others – regardless of how “misunderstood” you may appear to the general public. At the end of the day, as long as you’re at peace with who you are, you don’t really worry too much about what others might think. You’re never worried to be yourself. The best part about seeming “misunderstood” is that – in most cases – you’ll understand yourself perfectly fine. Sure, you may appear avant-garde to the majority of your peers; it’s also not done by any great accident. You’re simply being yourself. Humans are weird by nature. I’ve always believed the ones who appear the most normal are also the ones hiding the most. Being “weird” doesn’t always convert to being “misunderstood.” In reality, it usually coincides with being the most transparent – the most raw. And for this reason, you never find yourself trying to be someone you’re not. Certain trends can strike the fancy of an entire nation, yet, if they don’t appeal to you, it’s all for naught in your eyes. You’re comfortable with who you are. You could give a f*ck what anyone else is doing (or saying for that matter). You filter out close-minded people. You know you’re not misunderstood. You know you might be a bit different – a bit difficult, at times – but you also realize at any given moment, your intentions could be easily distinguished. By the right people, that is. To that end, you know those people who “understand” you (without having to label you as some societal derelict) are the ones you should be spending your time around. It’s great being labeled as “misunderstood” to most because it acts as a filter for close-minded people. Still, most people who call others “misunderstood” do so without having tried to understand them first. The entire state of “misunderstanding” is a temporary one, one that can be solved with just a slight amount of effort. After all, if the people around you don’t care to take the effort in understanding you – well, then why would you even care to be understood by them?